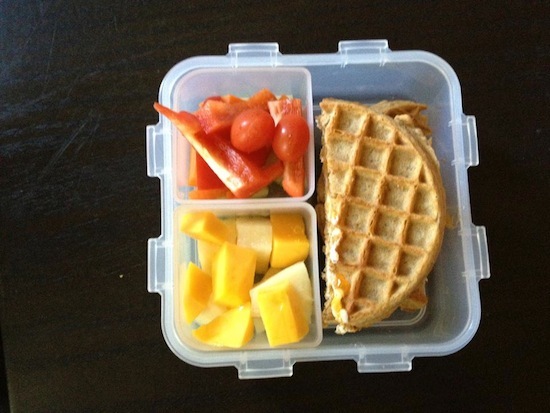 Making school lunch never seems like that big a deal -- on the first day of school. But by day two or three it sinks in: I've got to do this every single day of the school year. That's about 270 school lunches for those of you who are counting. When it comes to dinner, I'm a firm believer in one meal -- chosen mostly for the grown ups -- for the whole family. Approaching dinner this way keeps us parents satisfied (children be damned) and goes a long way to encourage healthy eating in our kids. But lunchtime is different. While I'm totally comfortable sending my kids to bed without dinner if they don't like what I serve, I'm not so comfortable with them having to endure a long day of school on an empty stomach. This presents a challenge: packing healthy school lunches that I know my kid will eat without making 270 peanut butter and jelly sandwiches. Getting creative with school lunch does not require a degree in fine arts. Sometimes, all it takes is changing up how you present staple ingredients that you know your kid will eat. My favorite quick tip is to ditch the sandwich bread. Sometimes that's as easy as skipping slices all together and opting for leftovers or a cheese and hummus plate. Other times, I like using novel ingredients, like waffles, in place of bread. And there's always sandwich sushi. Yes, seriously. And it's easy to make, too. Watch my latest back-to-school lunch video to see and also to get other ideas for how you can skip the sandwich bread for a more exciting school lunch. That should cover at least 75 of them. Now, just 195 more to go! Get your school lunch cheat sheet by liking One Hungry Mama on Facebook where Stacie posts a picture and quick description of every school lunch she makes. This year's lunches begin on September 9th! For more simple ideas and easy family recipes visit Stacie at her blog, One Hungry Mama, and subscribe to One Hungry Mama on YouTube.